Amisy apple peeling machine is a kind of automatic digital peeling machine which is controlled by PLC, it can carry out peeling, coring, slicing, and color-protecting in one time, also finish one step or two steps. Because of the peeling blade can automatically follow the shape of fruits, and the thickness can be adjusted, so the waste of flesh is less. Compared with traditional manual peeling method, it has the advantages of high peeling rate, low fruit loss, uniform peeling thickness, etc. Ideal equipment for fruit processing factory to make kinds of fruit products such as candied fruit, fruit juice, canned fruit and so on. 1. Made of superior stainless steel, attractive appearance, safety, and sanitation. 2. Totally computer controlled, PLC control system, touch screen design, very convenient to use. 3. High peeling rate, peel thickness is adjustable, low flesh loss. 4. Short the production cycle, reduce labor, greatly improve the labor productivity. 5. Stable and reliable performance, high quality, easy to operate and clean. 1. 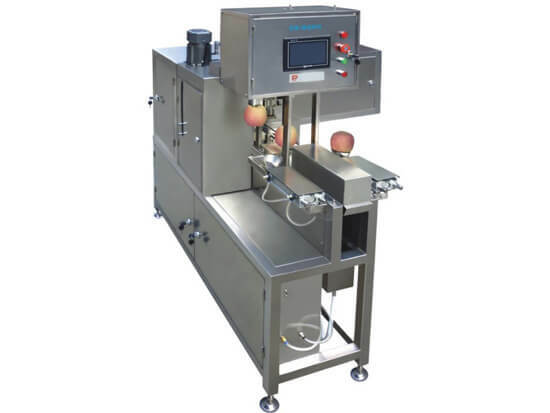 The apple peeling machine is a multi-function machine that can be used to peel the apple, and also for peeling many other fruits such as orange, pear, lemon, kiwi, persimmon, papaya, etc. 2. Amisy automatic apple peeling machine is the best choice for processing dry fruits, preserved fruits, canned fruits, fruit jam, fruit cake, fruit juice and etc. 1. Before starting the apple peeling machine, choose the suitable coring blade according to the diameter of fruits and choose the suitable slicing blade according to the quantity of slicing. 2. By clicking the touching screen, set the action and parameters. 3. Put the fruits into the feeder, the fruit peeling machine will automatically send fruit and carry out "peeling", "peeling-coring", or "peeling-coring-slicing". At the same time, the liquid in the protection color tank circulating spray the cut fruit to prevent oxidation. 4. Apple peel, apple core and apple flesh discharge from three exits respectively.